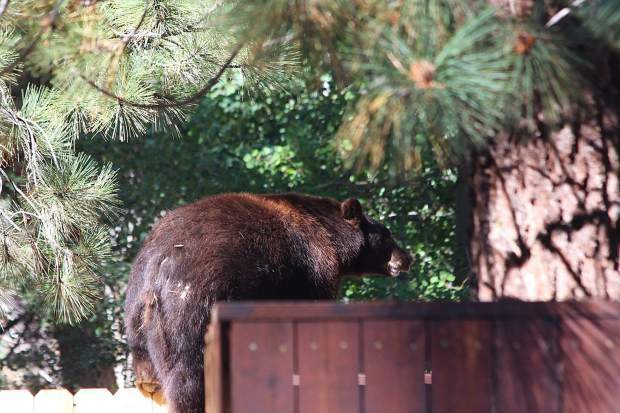 A bear climbs a fence in South Lake Tahoe near Riverside Avenue. Over the past few years we’ve seen many bear traps set by the Nevada Department of Wildlife in Incline Village and other locations at Lake Tahoe. Each time this occurs it is a reminder that all property owners need to be vigilant when it comes to securing their home or condo from the native wildlife. While the majority of the publicity and news articles are focused on issues concerning bears in search of food, the fact of the matter is that all types of creatures large and small have the potential for setting up housekeeping inside your abode. It’s important to check your property on a regular basis to make sure there are no holes or entry points that could entice chipmunks, squirrels or other small creatures to move in alone or with their family. While that woodpecker hole on the side of your house might seem like a novelty that you point out to visitors it can serve as a gateway for little critters in search of a home. Birds of all types seek safe places away from predators and it is very common for them to build nests on beams under the roof line. If you have a chimney it is very important to make sure that you have a properly fitting screen or spark arrestor so that a bird does not inadvertently fly down the chimney and get stuck. Skunks and raccoons find comfort in setting up housekeeping under porches and decks that are very close to the ground. These types of hiding places provide shade from the summer sun and make it difficult for predators such as coyotes to find them. You may wish to contact a pest-control expert when it comes to extracting a skunk otherwise your friends and coworkers might not want to see you for a couple of weeks. Never store trash in your garage and only put it outside on the day that your neighborhood is scheduled for pickup. Always use a bear box or wildlife-proof tote and never leave plastic bags of trash by the curb. Birds, coyotes, raccoons and other critters will rip into plastic bags scattering the trash up and down the street before the garbage man arrives. Doggie doors are a definite no-no. Creatures large and small will try to enter your house or condo no matter how secure you think your pet door may be. Clean your barbecue grill and don’t leave food unattended when you are cooking or cleaning up. If you have steps leading directly from the ground up to your deck you may wish to consider some type of decorative gate or fencing as a way to deter critters from making their way directly up the stairs. Leaving food in your car is taboo. If you have consumed food in your vehicle make an extra special effort to clean up every last crumb. A few small pieces of crackers or cookies, fast food wrappers, even lip balm have enough of a scent to attract a bear’s curiosity. Always lock your car even if you are leaving for just a few minutes. The bears know how to tug on door handles and if a bear gets into your car and the door slams shut you will be startled with the amount of damage that can occur as they try to free themselves from confinement.